Great Chapel of Mara is in the western end of Bravil's first island. This chapel specializes in Speed and Willpower. The building is divided into the Great Chapel of Mara, the Chapel Hall, and the Bravil Chapel Undercroft. When the Knights of the Nine quest Nature's Fury is completed, the chapel is attacked by Aurorans. The changes are noted below, including the NPCs that replace two of the four dead residents. All three front doors of the chapel reveal an entrance two steps elevated from the main room ahead. A staircase leads down from the entrance to a small hallway with three doors. The two doors on the west wall reveal the Undercroft and the door on the east wall leads into the Chapel Hall. The cathedral altar is at the end of the room, and nine altars to each of the Nine Divines surround the edges of the room. In the first room upon entering the Chapel Hall, two barrels in the southwest corner contain food, as do two more in the northeast corner, and another barrel in the southeast corner along with the two sacks beside it. The two wine racks also in the southeast corner each hold ten bottles of cheap wine. The bookshelf in the northeast corner holds a copy of the Restoration skill book 2920, Rain's Hand. Two loaves of bread, two bottles of Surilie Brothers Wine, and a bottle of Tamika's West Weald Wine sit on the table in the middle of the room. Through the doorway in the east wall, a set of stairs down to the north leads to Olava the Fair's bedroom. Her bed is in the southwest corner, and the chest next to it contains only clutter, with a bottle of Surilie Brothers Wine on top. The cupboard on the curved north wall contains clothing. The desk next to it holds clutter and/or a common book, and on top sits a loaf of bread. The set of stairs down to the south leads to Uravasa Othrelas' bedroom, with her single bed in the northwest corner. The chest next to it contains clutter, as does the desk on the south wall, along with a possibility of a common book. On top of the desk is a nirnroot. The cupboard on the east wall contains clothing. The door between the sets of stairs leads to Chana Mona's large bedroom, with her double bed on the east wall. The chest in the northeast corner contains clutter, as does the chest in the northwest corner with two pumpkins on top and the chest of drawers on the south wall with two bottles of Tamike's West Weald Wine sitting on top. The desk on the north wall contains clutter and/or a common book, and two apples sit on top. The cupboard in the southwest corner contains clothing. The two doors into the Undercroft both lead into a large room with a drain in the middle of the floor and a tomb on the north and south walls, with altars next to each. The stairs at the west end of the room lead down to a small area with another two tombs. The stairs in the northeast corner of the room lead down to a smaller area with a single tomb and altar. The stairs in the southeast corner of the room lead to an area exactly the same as the last, with a skeleton in the floor and a jewelry chest on the ledge next to the tomb. 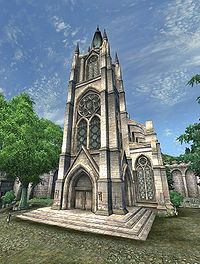 Upon completion of the Knights of the Nine quest Nature's Fury, Aurorans attack and desecrate the Chapel. Upon entering, there is blood on the floor in front of the doors, and on the northern door. Marz's corpse is draped over the rail to the lower doors, and a potion of Restore Health appears to have fallen from her hand to the stairs below. In the lower area lies Chana Mona's corpse with a dremora field arrow through her back. The pews in the main area are knocked askew and a great deal of blood is smeared on the floor down the center. Uravasa Othrelas' corpse is thrown onto the main altar at the end of the room, and the Dwemer runes written in blood around it appear to be similar to the runes found in the Chapel of Dibella. In the Chapel Hall, the table and chairs in the northwest corner are knocked down, and the barrels in the northeast corner are knocked over. The bookshelf next to them has some broken shelves, and the books that were there have fallen a little, along with some of the dishes that were on the smaller shelves. In the southeast corner, the wine rack on the left has been knocked over. The table in the middle of the room is smashed, and the bread and wine are on the floor. Olava the Fair's corpse is on the ground in the east doorway, holding a copy of The Adabal-a. What was Olava's room appears to be undisturbed, and this becomes Beem-Kiurz's bedroom. The room that was Uravasa's also appears undisturbed, and this becomes Eris Senim's bedroom. Esta página foi modificada pela última vez à(s) 03h52min de 5 de setembro de 2014.